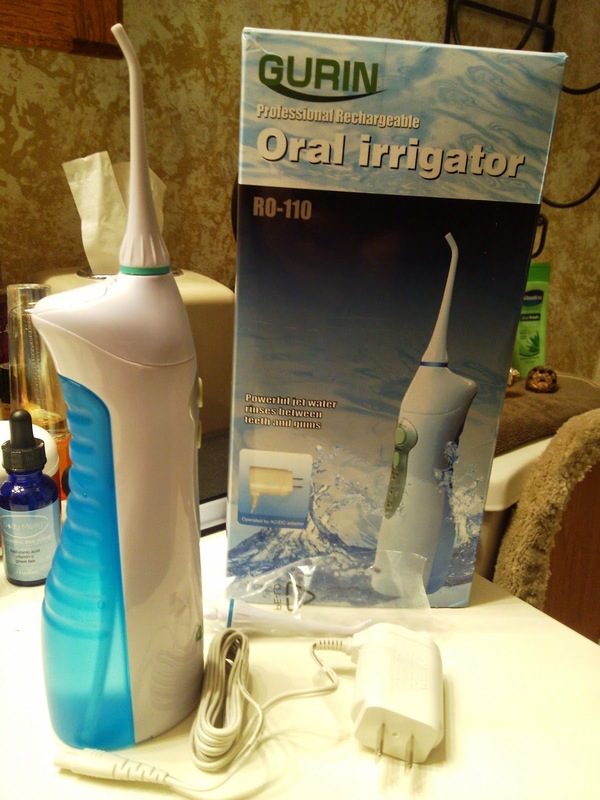 The Gurin Professional Rechargeable Water Flosser has a high capacity water tank and a rechargeable design. It comes with two color-coded detachable nozzles so it can be shared between family members, and it features three operation modes - Normal, Soft, and Pulse. This flosser uses a rechargeable Ni-MH battery inside that can charge up with the included AC/DC adapter. This makes it cordless until it needs to be charged. It does make a really quiet high-pitched sound when it charges, but it's hardly noticeable. There is a detachable water tank that you can fill either by detaching it and filling, or you can leave it attached to the system and open the reservoir cap to fill. I find it easier to remove the tank and fill it. And then when I'm done, I detach and shake out the water tank and let it sit up side down on the sink to drain. I've never used a water flosser before but have always wanted to try one, so I was really excited to get this for review. It took awhile to get the hang of using it, but now I love it. Turns out, you have to stop and spit out the water probably by the time you get half of one set of teeth done. I guess I never really thought about it before! It also took me awhile to get the hang of how long to hold the flosser to each tooth, but practice makes perfect. This is so much easier than flossing with string, and I actually DO it - I don't have to lie to my dentist anymore about how often I floss! I also really appreciate the different modes, I think my favorite is Normal, but I haven't really decided yet. But it's nice to have the different modes for different preferences. The interchangeable heads can also be rotated 360 degrees depending on preference. Overall, this water flosser is easy to use, versatile, and makes flossing quick, easy, and effective. It's also great for braces or other dental work, since the water just flows around obstacles. I also just learned that I can add a little mouthwash in the water tank for an even fresher clean - Cool!